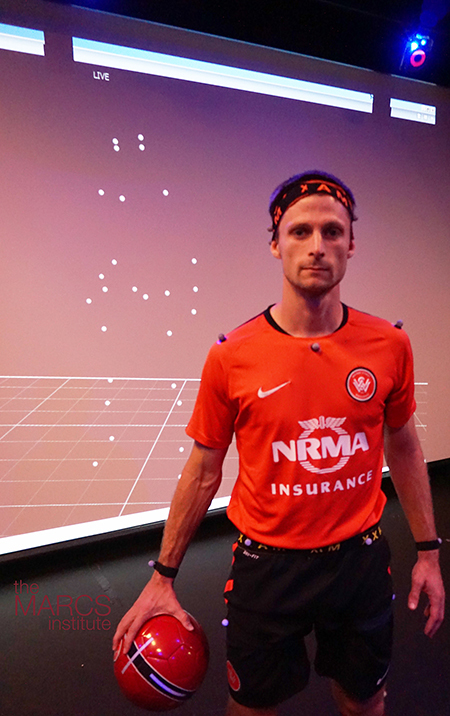 Western Sydney University's sponsored player, Shannon Cole, geared up in his Western Wanderers kit to demonstrate the 3D analysis of movement while kicking a ball, using The MARCS Institute's Motion Capture (MoCap) system. The MoCap system is optimal for capture and analysis of complex full-body movement such as kicks and ball passes in soccer, league or rugby. It can also be used to analyse golf swings, tennis serves, cricket bowling, circuit training, as well as the performances of dancers or musicians. "It was an interesting experience and something that I think most sports teams and athletes would find useful, especially whilst in rehab and reviewing their technique post injury," Shannon commented.